As I type this, my little boy is sleeping in my lap, exhausted from trick or treating for his first time, not having a nap, and having been in school today. He was Thomas the Tank Engine, and not entirely sure about the whole process of knocking on stranger’s doors. He caught on pretty quick when he realized that candy was the reward though! 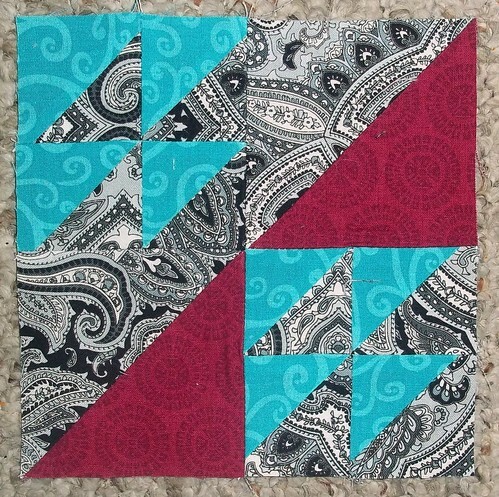 Tonight, I have more Farmer’s Widow blocks to share. I cannot wait until I get some more sewing time. I really want to work on other projects, but right now, one block at each stolen moments session seems to be all I get to accomplish. More fussy-cutting fun! The butter yellow is a Jinny Beyer print. The white/blue print I found in Joann’s nursery section. 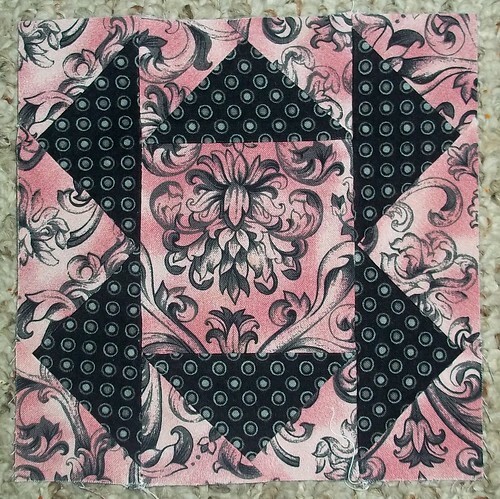 I thought it was too pretty and clean to put in an infant quilt. I ended up admitting defeat and paper-piecing this one. My original plan had been to make six flying geese units, but I kept losing triangle points, and that’s just not acceptable. 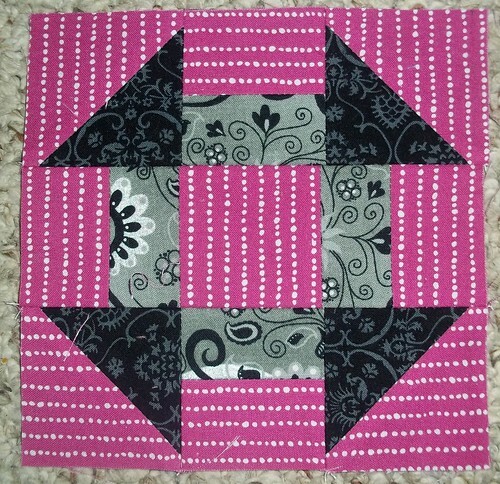 I’m forcing myself to incorporate pink into these blocks. However, I must say I like the contrast of the more modern dot print against the very traditional tone on tone black print. 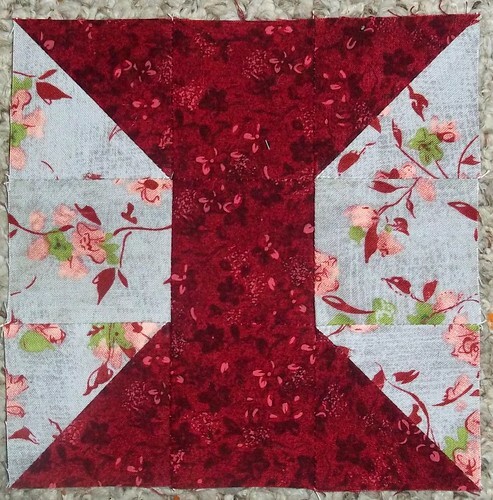 So many freaking HSTs, and finishing at 1″!! I was very glad to sew the last seam on this one. 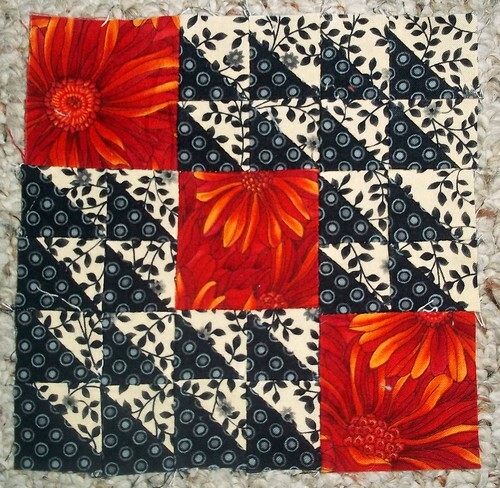 I was going to use a more geometric print for the orange, but kiddo got to my pre-cut pieces with his own scissors. I’m just lucky he didn’t attack the strips that were precut for the HSTs. I hadn’t realized, when I was piecing these, that my Evening Star and Buzzard’s Roost were going to come out so similar. I might re-do one or the other… On the other hand, there’s a lot of blocks, and I can just place them far, far apart in the top. Much happier with this iteration of Spool. 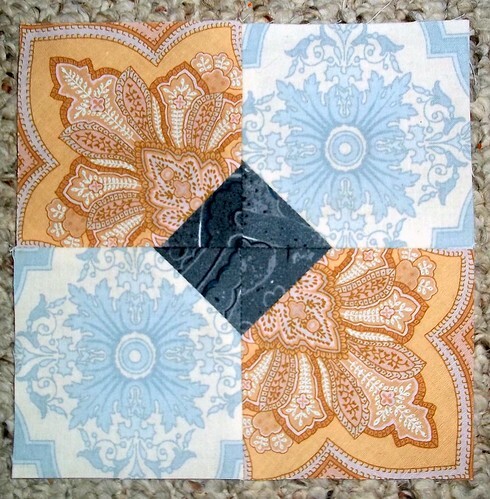 I’ve had the gray background fabric forever, along with some coordinating prints. 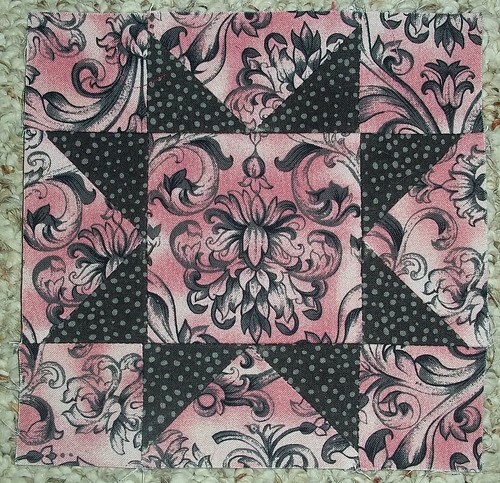 I’ve been collecting grays with pink and red in them for a Lone Star quilt. That’s it for this Farmer’s update. I’m headed for bed. Glad your little fella enjoyed his first Trick or Treat experience. What a day it must have been for that little tank!! !I love the blocks. The fussy cutting really pays off especially in the first one. Cut glass dish is next up on my to do list. I'm dreading that one, but I really like how you did yours. oh i love them all so much! i wouldn't redo the two that look a little alike. i would do just as you thought and place them far apart. you will never notice their similarity when you have them all done.